The milk will be given to newborns in neonatal units who can not access their mother's milk. "We have also established a technical working group at both national and county level to provide oversight and ensure adherence to quality and standard and developed guidelines and tools to support operations of the milk bank," said the British High Commissioner. "Working with the staff at the Pumwani Maternity Hospital, the county health team have finalized plans for the launch of the milk bank. 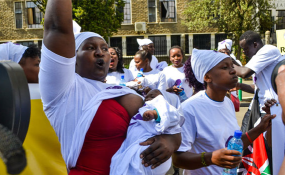 This will be symbolic of the importance of our respective government to place improving newborn health and life opportunities in Kenya," he added. Between 15 and 40 percent of vulnerable babies in neonatal units around the world lack access to their own mother's milk, often because of maternal illness, death, or abandonment.